I have now been privileged to be present at the birth of three grandsons. We have two additional grandsons who were born before we could quite get there. But that was okay too. We got there as soon as we could. Watching a baby come slip-sliding into the world with yes–a lot of pushing, panting, and moaning–is to observe creation at its wondrous best. And yes, it is easier to say that when you’re on the “You’ve got this!” “You’re doing great” end of things as a coach and cheerleader–along with the daddy–rather than panicking with “Oh help, I’ll never push this baby out, what am I doing to do?”. Not counting my own birth plenty of years ago, I have been present for six births; our own three daughters and three of the grandsons, most recently in late September. I was taken with the chatty and familiar conversations in the labor room and this time especially felt the drama of a quickened pace: “We’ve got serious labor going on here” was the immediate feel in the homelike but hospital-clean quarters of the birthing room. Each woman moved with synchronicity to her appointed tasks. All together, this labor was only four hours. The only male present and helping was the daddy. So it was not surprising that my mind was led to ponder the great company of women trading birth stories, comparing length and severity of labor, how many hours pushing, when the water broke, was the baby’s face sunny-side-up (harder) or handily face down? At this birth, a young technician, about six moths along herself with her first child, absorbed my daughter’s tips and stories: now a pretty experienced hand after three trips through labor. Yes, labor is messy, difficult, and intimate. Gone are the fancy words for bodily elimination functions, even from the doctor’s lips. In their place the everyday words are fine and feel comfortable in this setting. Grandpa was anxious to cuddle the new little one. So thankful for his safe arrival. to connect with others going through similar experiences, don’t we? I’m left marveling once again at the miracle of birth–and let’s not ever forget the mystery. Women around the world of every nation, color, religion, caste, income level and livelihood giving a new little child the gift of life. Even those who were unable or not wanting to give birth share this common entry point into the world–from our own mother’s womb, through the birth canal (or c-section), and out into the wild and wonderful world. Yes, scary and sad, too. But it makes me cry with joy and praise for our Creator who gave us the gift of body and breath, and the treasure of growing up into this one life. My mother’s heart also sorrows for the many who experience grief, pain, addiction, poverty and the inability to feed a newborn child. Our hearts are torn knowing not all are as fortunate to be born into loving and nurturing families. Bless all the foster and adoptive and grandparents who step up to care for the precious little ones among us. What stories or experiences does this make you think of? We’d love to hear your comments here! Send stories or comments to me at anotherwaymedia@yahoo.com or Another Way Media, Box 363, Singers Glen, VA 22834. Another Way is a newspaper column by Melodie Davis in syndication since 1987. She is the author of nine books. Another Way columns are posted at findingharmonyblog.com a week after newspaper publication. I’m so happy that you’ve been able to be there for the births of so many grandchildren. How exciting! My youngest sister was the last of us five sisters to become a grandmother on Sept 26, and we were all cheering her on as she waited the birth of her first grandchild. She was to be present for the delivery, but alas, other things happened and the baby had to be delivered by c-section. We were all relieved when we heard the news that mama and baby are fine. (Texting is a wonderful invention–in my opinion). Even though I live in another state, I love that we can stay connected at a moments notice. Yes to the texts! It was fun to hear those ding dings flying here and there sharing the good news. I’m sure your sister is enjoying the baby now. Thanks for sharing this story and for the good news that mama and baby are fine. Exactly eleven years ago today, Ian was born. Like all others, his birth was a miracle, but his survival just as miraculous as he was born three months early at 2 pounds, 5 ounces. I’m sure you’ve read my blog post about it. My own experience with childbirth was nothing like your daughters’. I was all alone in a cold, sterile environment drowning in waves of pain. Husbands weren’t allowed nor other family members either. I’m glad labor and delivery are much, much more humane these days. 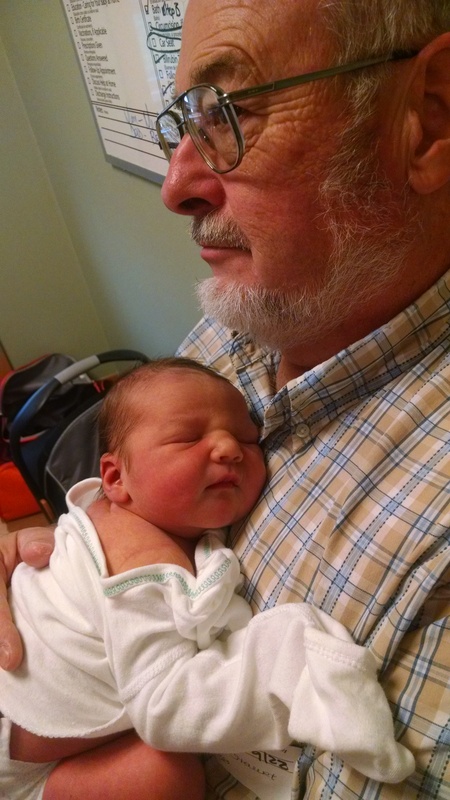 Congratulations on the new grandson, Melodie! Awww, happy birthday to your grandson, and yes, what a special day especially under those difficulties. “All alone in a cold, sterile environment drowning in waves of pain” would have made labor even more difficult, for sure! By the time our children came along, most of my friends and relatives were having fathers in the delivery room; my husband wasn’t so sure about it but he was a trooper through LaMaze classes and in delivery–especially our youngest when we all were either experiencing or recovering from winter’s flu season. That was a tough time but nothing like your family’s situation with Ian. Thanks for checking in with your special memories! I loved reading this post! Birth truly is such a miracle! Besides my own three births, which my husband actively participated in, I was birth coach for my sister two times, for three of my friends, and for our foster son’s girlfriend. Maybe if I ever run out of things to do I’ll volunteer to be a birth coach for young, fearful girls. Your experiences top mine here for sure! I’m not sure I would want to volunteer to do regularly (the hours at night!!) but I’ve contemplated looking at opportunities to help rock newborns maybe? Not sure if they let volunteers do that. Anyway, I’m glad you enjoyed this post. Blessings.